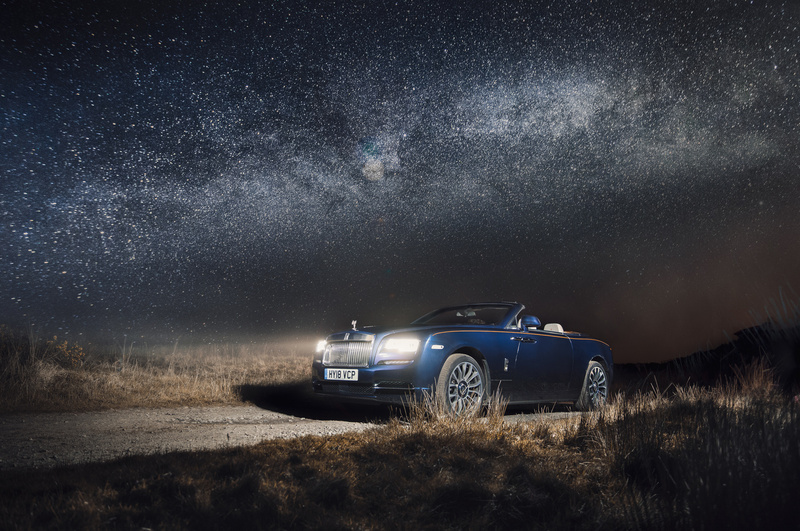 The Rolls Royce Dawn, top down underneath the Milky Way. I went to Cornwall, UK to shoot this image as the area is known as a 'dark sky reserve' meaning less light pollution from surrounding towns. Having found our location in the daylight, we returned at midnight and shot through until about 6am. This image was lit with a Godox AD200 strobe with MagMod MagSphere attachment. Approximately 12 strobe flashes were used to light the car, with a seperate exposure used for the sky overhead, all of which was then blended together in Photoshop then retouched to achieve the final look I wanted. The exposure for the sky was 30s, f/2.8 ISO5000 in order to bring it out the milky way as much as possible.